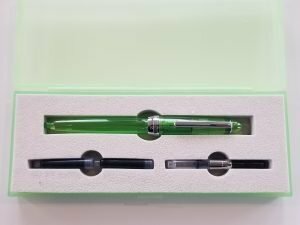 This is a review of the Monteverde Monza Jolly Green Special Edition Fountain Pen. Last year, I had the opportunity to review the Monteverde Monza in Honey Amber. 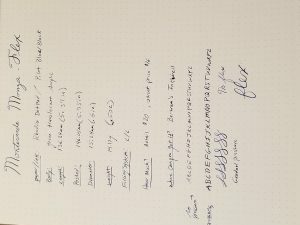 Overall, this lightweight demonstrator fountain pen really impresses me. Recently, YAFA introduced their new OmniFlex nib into their Conklin lines of pens. 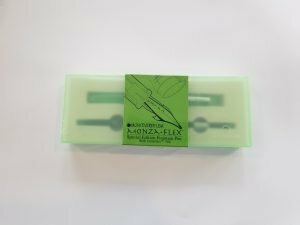 Seeing the demand for an affordable flex pen, they launched a new version of the Monza equipped with the OmniFlex nib. 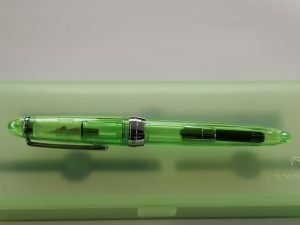 The review today is of the Monteverde Monza Jolly Green fountain pen. This was graciously sent to me for review by my friends at Bertram’s Inkwell. If you are interested in getting this pen for yourself, check out their store in Rockville, MD. It’s also on their website at Bertramsinkwell.com. Or, if you would like to win this one, please leave a comment on this post with which “flex” pen is your favorite. Be sure to click to receive follow-up emails so you can be notified if you are the winner. The contest will be open through October 31st, 2018. A winner will be randomly selected on or about November 1st, 2018. There will be free shipping within the U.S.; if international, the first $8 of shipping is included and the winner is responsible for the remainder. 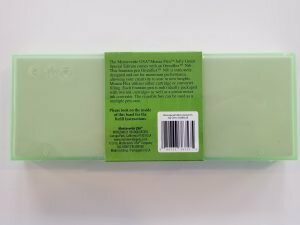 Packaging: The pen comes in a green frosted plastic box with the Monteverde logo on the bottom right hand corner. 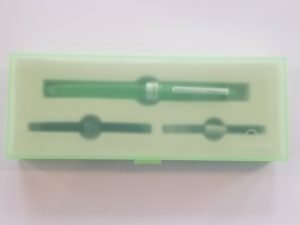 A green outer band wraps around the middle of the box. It says “Monteverde USA Monza Flex Special Edition Fountain Pen with OmniFlex Nib” on the front. On the back of the band, there is information about the Monza flex and the OmniFlex nib and the company contact information. Printed inside the band are filling instructions and an explanation of the Monza design and name: “The pen was named after the Italian city of Monza, known for its brilliant architecture, ever-green wineries, and its famous racetrack.” It is held in place in a foam insert which also holds two ink cartridges and a converter. As a nice bonus, the box is also usable as a pen case, which is a nice bonus and good thinking on Monteverde’s part. First Thoughts: I really like the color on this demonstrator pen. 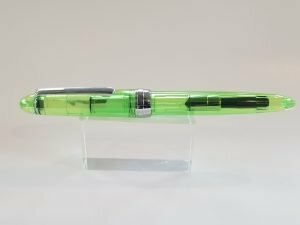 So many demonstrators are just clear, but the green tint makes the pen pop. Design: The pen has a classic cigar shape, tapering from the finials to a wide steel cap band in the middle with “Monteverde USA Monza” engraved around it. The clip is tight, but easily slides onto fabric to hold the pen securely in place. The cap screws on and has an inner cap which seals off the nib to prevent it from drying out when not in use. The threads for the cap are on the body above the grip section and are almost unnoticeable and smooth even if your grip is higher on the pen body. The grip section is smooth and has a small flare at the end to act as a finger stop. The feed is clear like the other Monzas, so it picks up a tint from the color of the ink you are using. The threads on the body are plastic and there is a small O-ring, which allows the pen to be eyedroppered. If you would like to do that, I just suggest adding a bit of silicon grease to ensure a good seal. 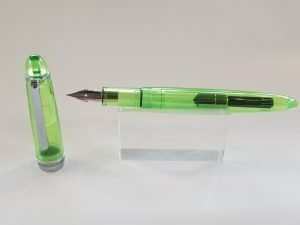 Nib Performance: The OmniFlex nib impressed me on the Monteverde Monza Jolly Green. With no pressure, the nib lays down a consistent extra-fine/fine line, depending on ink and paper. With pressure, it flexes out to a medium/broad line, again depending on the ink and paper. Therefore the feed keeps up well even with faster writing. I only had a few railroads, but I think that was due to user error and not the pen. They made the nib in a way that allows a bit of flex even with causal writing. This gives your handwriting a bit of a pop and makes it look better than it really is. Filling System: This pen includes a converter and two ink cartridges. The seal on the converter is tight so you have to apply a bit of pressure when you first insert it into the pen. Since the pen has a plastic body and plastic threads, you can convert it to an eyedropper it as well. Value: The retail price for this model is $20 and Bertram’s Inkwell has it on sale currently for $17.95, which I think is a great price for a solid entry-level pen with a wonderful flex nib that writes beautifully right out of the box. Many entry-level brands sell the converter separately, which can be an inconvenience, but Monteverde includes the converter and two cartridges so you can start writing as soon as you open the box. The dual-purpose box/pen case is a great idea since people normally just throw pen packaging away. Overall: Most importantly, I was impressed with this pen from the previous review, but the OmniFlex nib addition took this pen to a whole new level. I have used several flex nibs in steel, gold, and titanium, and this nib’s performance is right on par with flex pens 10 times the price. Monteverde (YAFA) did a wonderful job introducing a great flex nib at an affordable cost. 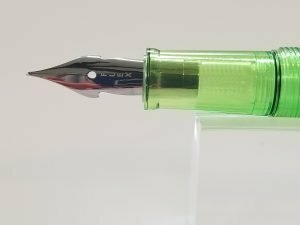 I think that this will open the flex nib world up to a lot of pen users. Pros: Great package for the price, flex nib, nice color, light body, writes beautifully out of the box. Cons: Light materials may be prone to cracking. 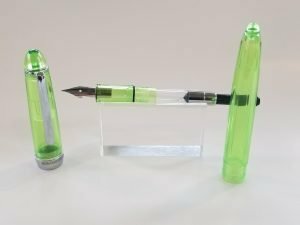 Check out the Monteverde Monza Jolly Green Special Edition Fountain Pen here.